Recalling the famous Apollo-era pictures of Earth taken by lunar astronauts, this digital image is a spectacular portrait of the Western Hemisphere at the time of one of the strongest hurricanes ever observed in the Eastern Pacific. This combination of science, engineering and artistry was generated by researchers in the Laboratory for Atmospheres at NASA's Goddard Space Flight Center, Greenbelt, MD, using data from three different Earth-observing satellite instruments. The research team's goal was to assemble an image that recreates the visceral impact of viewing Earth from space with human eyes. The prominent storm raging off the west coast of North America is Hurricane Linda. Other obvious features include the shallow waters of the Caribbean and sediments around the mouth of the Amazon River. The underlying image of the full disk of Earth and its clouds was taken on September 9, 1997, by a Geostationary Operational Environmental Satellite (GOES) operated by the U.S. National Oceanic and Atmospheric Administration (NOAA), and built by NASA. The ocean data was collected in late September and early October 1997 by NASA's Sea-viewing Wide Field-of-view Sensor (SeaWiFS) satellite. The land color is portrayed by a vegetation index calculated using data collected from September 9-19, 1997, by Advanced Very High Resolution Radiometer (AVHRR) instruments carried aboard NOAA's Polar Orbiting Environmental Satellites (POES). These data are draped across a digital elevation model of Earth's topography from the U.S. Geological Survey. 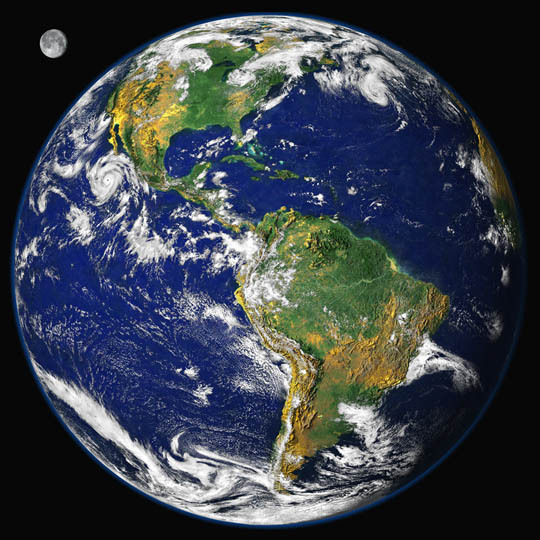 The complete computer image file is 26 megabytes, making it one of the most detailed Earth images ever created by NASA! The researchers chose to translate the digital data over land into a color scheme where heavy vegetation is green and sparse vegetation is yellow. The heights of mountains and depths of valleys have been exaggerated by 50 times their actual levels so that vertical relief is visible. The shadows for the mountains were calculated from the exaggerated heights. The presence of the Moon in this image is an artistic addition. The lunar image was collected by GOES in September 1994, and has been magnified to about twice its relative size.